8.3M Smart Meters and Counting in U.S.
Research firm Parks Associates says 8.3 million smart electric meters have been installed at U.S. residences to date – a little more than 6 percent of the total, up from about 4.7 at the end of last year. The march of smart meters into American homes continues, with 8.3 million electric meters capable of two-way digital communications installed – and that number is set to quadruple by 2011. That's according to a new report from research firm Parks Associates released this week, which counted up smart meter penetration across a range of U.S. utilities. The 8.3 million smart meters installed as of May 2009 make up more than 6 percent of the total number of residential electricity meters in the United States. That's up from 4.7 percent penetration as of 2008, according to a December report from the Federal Energy Regulatory Commission (see Smart Meter Installations Grow Nearly Fivefold). But the real growth is set to come in the next few years, as large-scale smart meter deployments by the country's biggest utilities - as well as smaller scale installations by hundreds of smaller cooperative, municipal and public utilities – continue, according to Bill Ablondi, Parks Associates' director of home systems research. Smart meter penetration is expected to grow to 13.6 million by next year and more than 33 million by 2011, he said. it spells opportunity for the host of companies seeking to provide homeowners with smart meter-linked platforms that measure and, in some cases, control energy use to help homeowners and utilities save energy and money, he said. Dozens of startups are seeking to enter that market, including Tendril Networks, EnergyHub, Energate, Control4, Greenbox Technology, Onzo, AlertMe, OpenPeak, Current Cost, Sequentric, 4Home, Agilewaves and others (see The Smart Home, Part I and The Smart Home, Part II). IT giants Google, Microsoft and Cisco have also entered the field with offerings of their own. Google and Microsoft have Web-based software they hope to popularize in partnerships with utilities and smart meter makers, and Cisco has plans to make home energy management hardware as part of a broad-ranging set of smart grid efforts (see stories here, here and here). Some of the home energy management contenders are focusing on partnerships with utilities, while others are seeking to sell directly to consumers. Others are eyeing partnership with telecommunications companies that could offer a third way into the home (see The Telco Home Energy Invasion). Will consumers welcome the offerings at hand? According to Ablondi's research, it's quite likely. About half of U.S. households are installing more efficient light bulbs and taking other energy-saving measures, he said. And about half have installed programmable thermostats – though only three-fifths of those actually use them. The difference between installing energy-monitoring equipment and actually using it is something on the minds of appliance makers like General Electric and Whirlpool as they plan the rollout out "smart" appliances that could connect to smart meters to turn down when utilities are facing peak loads. Some industry observers feel that utilities should control home energy more directly to cut down on power use during peak demand times. Others feel the utilities should set up pricing schemes that charge more for peak demand power, and then send that information through smart meters or other connections to homes to achieve the same result. "I think that the consumer in a lot of ways will be the ultimate wild card in this residential energy management equation," Ablondi said. Parks Associates noted that investor-owned utilities - those that aren't publicly owned - made up the largest number of smart meters installed so far. Those include Pacific Gas & Electric Co, which said this week it had 1 million smart electric meters sending hourly data to the utility, out of a total of 5 million it plans to deploy by mid-2012. (The utility is also deploying millions of smart gas meters). Texas utility Oncor also announced this week that it had about 200,000 smart meters sending data to the utility every 15 minutes, out of the 3.4 million it plans to deploy by 2012. Other investor-owned utilities have made strides in installed smart electric meters, according to Parks Associates. They include Southern Co. subsidiaries Georgia Power with 750,000 meters out of a planned 2.16 million, and Alabama Power with 448,000 meters out of a planned 1.2 million meters. Then there's Alliant Energy with 231,000 meters out of a planned 845,000 meters, Arizona Public Service with 217,000 meters out of a planned 880,000, and Florida Power & Light with 100,000 out of a planned 4.5 million meter deployment. Other utilities with multi-million smart meter plans, such as Southern California Edison, CenterPoint Energy, Duke Energy, DTE Energy and American Electric Power and Pepco Holdings Inc., are also installing meters, though not as many to date, the report stated. But in terms of the percentage of their residential customers that now have smart meters, the big investor-owned utilities are actually being outpaced by the country's (mostly) smaller municipal utilities, public utility districts and electricity cooperatives, Ablondi said. 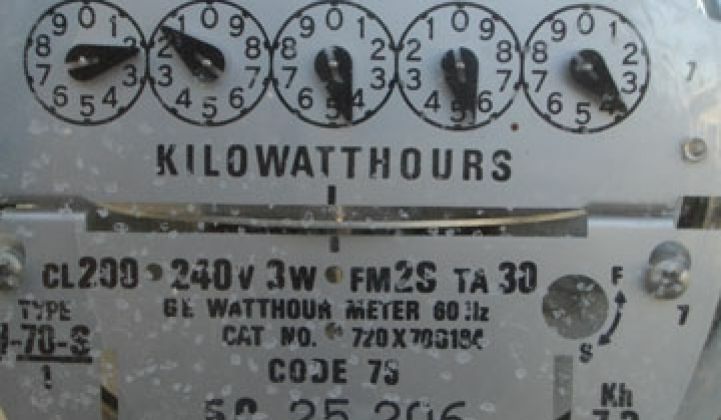 Investor-owned utilities have deployed meters to less than 10 percent of their residential customers, while municipal utilities and public utility districts are at about 12 percent, and co-ops are approaching 20 percent, his report showed. Top on the publicly-owned utility list is the municipal utility Austin Energy, with 410,000 smart meters out of a planned 500,000 (see Top Ten Smart Grid: Utilities). Arizona-based Salt River Project was second with 375,000 meters out of a planned 930,000.